Fassolada me Loukaniko (stewed beans with sausage), is a rustic, hearty, nutritious and comforting Greek bean stew which is perfect for the cold days ahead of us. The recipe is similar to the classic dish but the addition of the sausage adds much more flavour. Although the weather is still warm here in Assini and we are still going to the beach, today it was cloudy and rainy this morning, so instead of making Fassolia Piaz, (a Greek, cold Bean Salad) as planned, I changed my mind due to the weather and decided to make Fassolada. It’s been a while since we last ate it and was craving for it for a long time. The farmers’ market in Nafplion is every Wednesday and Saturday but due to other commitments, we did not go on Wednesday. Whenever we go to the farmers’ market, I buy provisions to last for a week. However, today when I started cooking, I discovered that the celery was not so fresh so I did not add any. Last week, at the farmers’ market I found a bargain, when an old man was selling a bag full of lovely, ripe, tomatoes for just one Euro. He said they were seven kilos and I thought that probably half of them would be rotten but still they were cheap. I regret not buying more as all of them turned out to be perfect. After making an X on the rear side of the tomato and boiling them for a few minutes, I peeled and blended them in a food processor. I then filled plastic cups and froze them, to use whenever my provisions finished. I do this often as we live a little bit far from Nafplion and the villages around us are all touristic so the local supermarkets sell everything much more expensive. I try to stock non perishable ingredients and I freeze a lot of vegetables, such as bell peppers, eggplants, green beans, okra, artichokes, vine leaves, various herbs, even orange juice during the winter and lemon juice when the lemons are very cheap. When taking the tomato cups out of the freezer, I remembered that I had some sausages stocked as well, so I took one out, to use it in the dish I was about to make. I let them sit for about an hour to defrost but this is not absolutely necessary, as the sausage can easily be cut into slices when frozen and provided there is some liquid in the pot, when you add the frozen tomato, you keep stirring it and keep adding some of the hot liquid on top and the tomatoes will soon thaw. The recipe is almost identical to the classic fassolada. After sauteing the onion and garlic in a large pot, I chopped the sausage into slices and sauteed it as well. When adding the spices I also added a hot chilli pepper (you can add more during winter if you like it really hot but as the weather is still warm, I made it mildly hot). I used local pork sausages which are made by my butcher in which he adds leeks and various spices. The dish was amazing! The sausage released all its aroma and flavour which made the “fassolada” even tastier than usual! As I have recently posted, my blog has been nominated by BHMAGourmet for an award, in the category “Best Greek cooking in English”. If you have not yet voted, you can still vote for my blog until the 14th of December, 2015, here. Drain the water and place the beans in a pot with fresh water. Boil for a while and remove any froth which arises. Drain once again. Add fresh water and cook until slightly soft, about half an hour. Drain and set aside. After wiping the pot to dry, heat the olive oil in the same pot and sauté the onion until translucent. Add the sausage and saute stirring it a few times. Add garlic, carrots and stir. Add the bay leaf, chilli pepper, tomato paste and season with salt and pepper. After stirring, add the beans as well as the fresh tomato and enough water to cover the beans. Bring to a boil, lower heat, cover the pot and simmer for about an hour, stirring regularly, or until the beans and carrots are soft and the sauce thickens. Just before the end, mix in the parsley. Serve with toasted bread with a drizzle of olive oil on top! 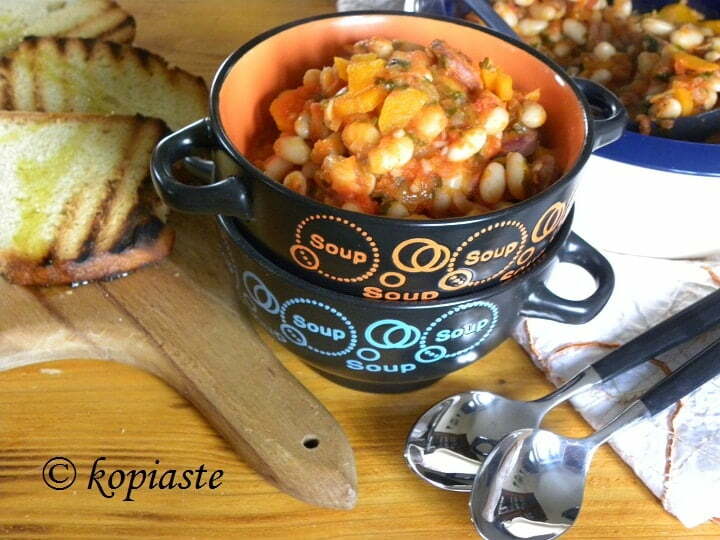 Filed Under: Easy Recipes, Greek, Greek Traditions, Healthy Recipes, Legumes, Main Dishes, Soups Tagged With: beans stew, BHMAGourmet, Blog awards, fasolada, fasoulada, fassolada, Fassolada me Loukaniko, Fassolada with sausage, frozen tomatoes, Giahni, Mediterranean diet, More Than A Greek Salad, vgfoodblogawards, Vima Gourmet Blog Awards, vimagourmetfoodblogawards. Comforting and delicious! A great dish.